By Samdup Tenzin, Edinburgh, UK. After months of political theatrics in the Tibetan Diaspora following His Holiness the Dalai Lama’s official announcement to retire from active politics, the dust now seems to have, more or less, settled on yet another historic episode in the evolution of our exile movement. While I have my reservations about the manner in which some of the changes were brought about, I am, in general, quite pleased by the scale and the sophistication of deliberations that took place in the aftermath of His Holiness’ March 10th statement. That said, one of the key issues which I thought was conspicuously missing from these, otherwise wide-ranging, discussions was the issue of long-term financial sustainability of the new Dalai Lama-less Central Tibetan Administration (CTA). It is with an intention to stir a debate on this critical issue that I have decided to write this piece. There is no hiding the fact that our exile administration’s dependence on the person of His Holiness is not limited to political leadership; it stretches to, among other things, financial matters as well. It is a lesser-known fact that nearly a quarter of the CTA’s annual revenue comes from the coffers of the Dalai Lama’s Private Office. Now that His Holiness has already renounced all his decision-making powers, I think it would be grossly inappropriate for us to continue to look up to Kundun to bear the brunt of the CTA’s operational costs. Thus, in the next few years, in line with our goal to transform the CTA into a completely self-sustaining body, I think measures must be taken to gradually relieve His Holiness of this last remaining responsibility too. This, I feel, is necessary for two important reasons: Firstly, we cannot claim to have a complete separation of religion and politics if our government continues to derive a sizable chunk of its revenue from, what is now, for all intents and purposes, a truly private, non-governmental entity outside the ambit of the CTA’s institutional structure. Secondly, the hitherto assured financial contribution from the Dalai Lama’s Office cannot be taken for granted for long because with His Holiness approaching his 80s, he would not be able to travel as frequently and undertake as many international commitments in future as he is now. This will, in all likelihood, put a dent in proceeds received by Kuger Yigtsang, which would in turn adversely affect the CTA’s budget if alternative sources of revenue are not thought of and/or strategies to supplement existing income are not discussed at the earliest. I am certain that our Kalon Tripa-elect, Dr Lobsang Sangay, who won many of us over with his call for “Unity, Innovation and Self-Reliance” during the election campaign, will have a few ideas up his sleeves to address this important issue. I, like many of us, am waiting in anticipation of new projects I expect him to initiate when he takes over the political mantle in a few days’ time. I will say here that I quite like his suggestion to economically link Tibetan settlements in India, Nepal and Bhutan with various established Tibetan communities in the West. This coupling of relatively affluent, well-established Tibetans in the developed countries with those residing in remote and materially backward settlements in the Indian subcontinent will, apart from strengthening ties and promoting collaboration between Tibetans, relieve the CTA of a considerable amount of financial strain. We need to further explore ideas like this, which, though unconventional, are fairly practical. The TGIE’s reliance on external assistance in the decades following its inception is quite understandable given the momentous task of rehabilitating thousands of refugees from Tibet that fell upon it. But now with livelihood and financial circumstances of the majority of us improving progressively, we, the exiles, could perhaps take matters into our own hands when it comes to disproving allegations of the CTA being a “Dalai Clique” or a “Western Proxy”. This, I believe, could only be achieved if every one of us digs deeper into our pockets and, according to our individual capacities, forks out money so as to increase our collective financial stake in the exile administration, which, at present, is disappointingly low. 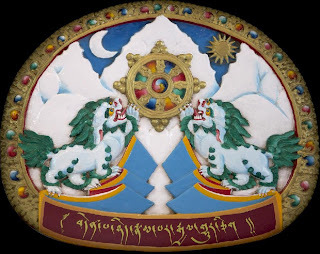 I say this because it is only through such monetary sacrifices and acts of generosity on our part that the CTA can be transformed in to a strong, independent institution funded primarily, if not exclusively, by the Tibetan people. Moreover, by raising a respectable proportion of our government’s annual budgetary requirements organically, we will not only be counteracting Chinese propaganda but also silencing many critics of our movement. Even if we were to raise 50 percent of the CTA’s annual revenue on our own in the next couple of years, we would have done wonderfully. That said, without firmly establishing the necessity of investing in our exile government, many of us would be understandably reluctant to part with our hard-earned cash. This is where, I think, a comprehensive debate on this issue in the public domain, touching upon various dynamics involved might be helpful to get our priorities as a nation right. Perhaps, one of the Tibetan NGOs active in exile could take the lead in this respect. But eventually nothing less than a community-wide grassroots movement- akin to the one initiated in the late 1980s and the early 1990s to boycott Chinese goods- will be required to persuade the general populace to make the CTA financially theirs. I want ordinary Tibetans to be economically more involved in the administration of our affairs because I think it will have, among other things, a positive knock-on effect on their political psyche. We as a nation are culturally conditioned to be subservient to those in authority. Most of us hardly ever stand up to challenge what is conveyed to us by our leaders- both political and religious; and many of us choose to suffer in silence even when treated with contempt and condescension by those who are meant to serve us. This, I think, will change for the better as we start to pump in more and more money to help run our government. The gradual increase in our financial stake in the CTA will make us feel empowered and emboldened; we will start paying more attention to how our money is spent by our elected representatives and speak out openly if and when any mismanagement and abuse of funds is detected. This renewed confidence and assertiveness will not be confined to budgetary matters, I expect it to gradually percolate into other areas of public life as well. This, in turn, will mean that those in power will be obligated to go among ordinary Tibetans on a regular basis to gauge their views on various issues of national significance; they will not dare to treat people with disdain and casually ignore their wishes. In other words, our Mangtso will not reek of hypocrisy, and the CTA will be a step closer to being a government of the people, by the people and for the people, in the real sense of this phrase. But the responsibility to make the CTA fiscally self-reliant does not rest on ordinary Tibetans only; our elected representatives have to do their bit as well. I would like Dharamsala make a few changes in the existing institutional orthodoxy so as to attract more funding from the general populace. One of the things meriting reconsideration, in my opinion, is the lower threshold of voluntary contribution (Chatrel), which every green book holder in our community pays to the exile government. The current minimum threshold, for instance, for unsalaried Tibetans, 18 years and older, residing in the Indian subcontinent is a paltry 58 rupees, which, put into perspective, does not even compare with what an average eight year-old spends on sweets/candies in a month. If 58 rupees a year is what a substantial number of us are contributing to our cause, I do not blame the CTA for foraging elsewhere for handouts. 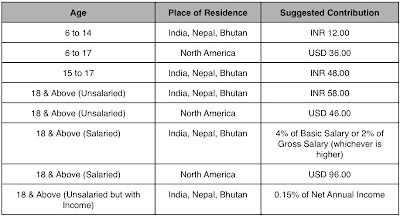 I think existing Theb Jangu thresholds (see table below) are patently at odds with the standard of living of majority of Tibetans in the diaspora today, and are in need of urgent review. Perhaps a bill to discuss this matter could be introduced in the parliament by one (or more) of ourChitues and, according to consensus, measures could be taken to set thresholds at sums that better reflect the current economic circumstances of Tibetans in exile. I, for one, would like to see a liberal increase in minimum thresholds for all age groups but I also strongly believe that any legislation on this issue must make allowances for a minority among us who are genuinely poor and incapable of making substantial contributions to the government. Irrespective of which age group these individuals belong to, they should either be exempted altogether from making any payments or, if that is not feasible, appropriate concessions should be granted to them. Such a legislation amending the Chatrel system will not only be fair and reasonable but also extremely productive. For starters, it will singly boost the CTA’s income by a few million rupees. Under the current system, most of us, notwithstanding our financial condition, just pay the threshold amount expected of us despite our ability to contribute more and despite subtle intimations by the Department of Finance (DoF) to do so. Such an unenthusiastic attitude towards taxation- voluntary or otherwise- is not specific to Tibetans; it is, in fact, a universal thing. So, unless the CTA itself raises the benchmark through legislation, most of us will happily stick to the current rates. Raising thresholds, however, is only half the battle. To achieve consistent growth in the share of revenue gathered from the masses, the new administration will need to display a considerable amount of ingenuity in its approach. Firstly, the CTA will have to devise incentives to encourage those, who are financially well situated to contribute over and above the revised minimum threshold. Although the vision of a self-sustaining government alone will be sufficient motivation to contribute more for a zealous few amongst us, many others in our community will require more tangible stimuli to spring into action. Personally, I would like the CTA to publicly honour 5 Tibetans every year who make largest individual monetary contributions to the government either on the 6th of July (His Holiness’ Birthday) or on the 2nd of September (Democracy Day). If His Holiness himself could be requested to bestow these honours on them, it would considerably add to their prestige. The Kashag could additionally send an official letter of appreciation bearing the signature of the incumbent Kalon Tripa to each of the next 5 biggest contributors so as to secure their continuous financial support. I think such official acknowledgements by the CTA will resonate with ordinary Tibetans, and will be deeply cherished by all. Secondly, the mode of payment of green book contributions needs to be diversified and made more convenient. The Research and Policy Unit of the DoF, which is responsible, inter alia, for “refining the processes within the department…to increase [its] efficiency and productivity” should explore appropriate avenues to do so. An oft-proffered suggestion, in this respect, is to contrive an online mechanism for making Theb Jangu contributions from the comfort of our living rooms. A plan to launch a Green Book Website to enable online payments was, in fact, announced by the DoF in August 2005. Six long years have elapsed since then but an operational Theb Jangu website remains as elusive as ever. I wonder what is taking the DoF so long to make good on its six-year-old promise? a) At a time when the battle lines on the issue of Tibet are being drawn online, the CTA, by enhancing its visibility and by making available easily accessible information on every aspect of our exile movement on its departmental websites, will not only be able to neutralize the bulk of false propaganda about us being disseminated on the web but also be able to cement its reputation as an open and transparent organization capable of standing up to any kind of objective scrutiny. Moreover, this will enable the CTA to keep geographically scattered exile Tibetan population better informed about events and issues being deliberated in Dharamsala, which would, in turn, prevent wild speculations and unsubstantiated rumours in our community concerning important political issues of interest to all. b) Such websites will enable the CTA to broaden its international support base and raise awareness about the Tibet issue without having to expend too much of its limited financial resources. In the fiscal year 2010-11, the DoF allocated 28 percent of its annual budget on increasing awareness of our cause. I think some of that money could have been saved and the scope of our awareness campaigns greatly expanded just by moving them to cyberspace, which, according to latest figures from the UN, comprises of a global audience of more than 2 billion netizens. c) Simply by incorporating a convenient online contributions page on each of the seven departmental websites along with detailed information on projects/ventures requiring financial input, the CTA, I believe, will be able to draw contributions from thousands of conscientious Tibet supporters from every corner of the world. 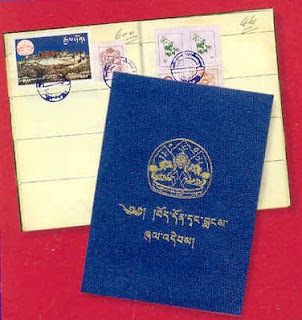 Not many people know that the DoF, in coordination with the Tibetan Solidarity Alliance, issues what is called the Blue Book (see picture below) patterned after our Theb Jangu, to any non-Tibetan supporter of our cause who pledges a certain amount of money to the CTA annually. Though I have not come across any figures on the number of such blue books issued till date, I have reason to believe that their circulation could be boosted markedly by actively promoting them online and making available an integrated payment system on the DoF website. 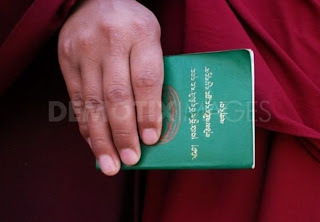 This payment mechanism could be used not only for Green Book and Blue Book payments but also for other additional contributions, which Tibetans and non-Tibetans alike might wish to make. It appears to me that the Blue Book project has been conceived with only our western supporters in mind. I would like the DoF to expand its scope to also include thousands of Tibet supporters in India, Nepal and Bhutan. This could be easily done just by putting in place two separate thresholds for Blue Book donations viz., one for our friends in the Indian subcontinent and one for those in the West. I, personally, favour such stigma free fund-raising schemes to any other for the simple fact that they do not give ammunition to our critics who often accuse the CTA of receiving money from governments and organizations alleged to have clandestine motives and vested interests. I understand that it would be unrealistic on our part to expect the CTA to completely overcome its dependence on external assistance within the next few years but we could at the very least take concrete steps, while still receiving funds from sources outside our community, to dissuade our critics from constantly downgrading our exile movement. I think much of the usual criticisms our detractors come up with could be easily negated if the CTA makes it a point to use only those funds, which are generated through our green book payments for all our campaigns of political nature, be it something as big as organizing a gathering of International Tibet Support Groups or something as trivial as issuing a press statement to respond to potential overtures from Beijing. In other words, I would like the CTA to make a conscious effort to limit the use of external funds we might receive in future, as far as possible, to only educational, healthcare, welfare and developmental projects in our community. Even in these apolitical fields, our dependence on outside assistance could be lessened to some extent if our religious institutions and monasteries, which have traditionally been the bedrocks of our community, take it upon themselves to make available some of the essential services such as clean drinking water, sanitation, healthcare facilities, schools, employment opportunities etcetera, which the CTA is not always able to provide to our people without seeking external aid. I strongly feel that in the times ahead, which will no doubt be testing for our movement, our religious institutions will need to rethink their role in our society. They could, perhaps, draw inspiration from Christian Churches and organizations, which have, while attending to godly matters, completely immersed themselves in various social causes to bring about noticeable, positive transformations in the lives of thousands of ordinary people. I, for one, feel a bit uneasy seeing multi-million dollar shrines and temples with extravagant murals and statues of our deities encrusted with every precious gem in the world oddly stationed slap-bang in the middle of our fast degenerating Tibetan settlements where the elderly subsist without proper care, unemployed youths, dejected and resigned to fate, wander aimlessly on streets, and where people generally struggle to eek out a living. Such stark contrasts can be minimized only if our religious institutions actively work alongside the CTA to address some of the major issues affecting our settlements. Given the fact that Buddhism as a religion, like Christianity, is based on some genuinely emancipatory metaphysical ideas, it will only be proper for our monasteries in exile to expand their locus operandi beyond religious activities to include more practical undertakings of charitable nature, which will not only change the lives of a multitude of ordinary Tibetans for the better but also significantly lighten the burden on Dharamsala. To sum up, an alliance needs to be forged between ordinary Tibetans, the CTA, and our NGOs and religious institutions in exile in order to effectively tackle imminent financial challenges ahead. The long-term survival of our exile movement might just depend upon the strength of such an alliance.